Please allow me to first express my sincere thanks to the Chinese communities in Scotland for your warm hospitality. This is my third visit to Scotland in my role as the Chinese Ambassador. I first came on an inspection tour on the work of the Chinese Consulate General here in Edinburgh, and the second trip was to accompany the visiting Vice Premier Li Keqiang early this year. My visit today is an official one, which has three purposes: firstly, to pay a visit to First Minister Alex Salmond; secondly, to participate in the CBBC Scotland China Dinner; and thirdly, to meet with the Chinese communities in Scotland. First, the development of our motherland. This year is very important for the Communist Party of China (CPC) and the country as well. First of all, this year marks the 90th anniversary of the founding of the CPC. Not long ago, CPC General Secretary Hu Jintao delivered an important speech at the conference marking the 90th anniversary of the CPC. General Secretary Hu reviewed the achievements made by the Chinese people under the CPC’s leadership. He pointed out that as the world, China and the CPC undergo profound changes, China is confronted with unprecedented situations, and many new problems and new challenges, including the test of governance, the test of reform and opening-up, the test of the market economy and the test of external environment. General Secretary Hu stressed that the CPC is bold enough to change and is ready to chart a new path. The party would never stand still, waver, slacken its efforts, or seek self-inflicted setbacks. The Party would pursue happiness for the people and prosperity for the country. 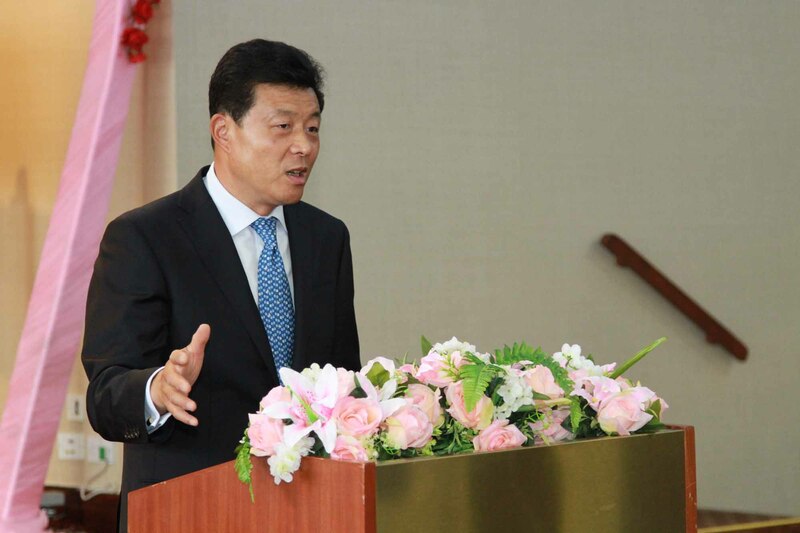 General Secretary Hu’s deep insight and analysis pointed to the path forward for China. Secondly, this year is the first year of China's "Twelfth Five-Year” Plan. The general spirit of the plan is to accelerate the transformation of economic development model, optimize the economic structure, boost domestic demand and consumption, and put more emphasis on quality and efficiency of economic growth. It’s designed to address the unbalanced, uncoordinated and unsustainable aspects of the Chinese economy. A person not only needs to grow taller, but also should become stronger, more intelligent and mature. Likewise, the ultimate purpose of economic development is to benefit the public. Therefore, the "Twelfth Five-Year" Plan pledged persistent efforts to protect and improve people's livelihood and promote social fairness and justice, so that the fruits of development can be shared among all the people. This year also marks the centenary of the Revolution of 1911 in China. The Revolution ended China's feudal autocracy which had lasted thousands of years and set the stage for the Chinese nation’s rejuvenation. Now, both the mainland and Taiwan are commemorating the Revolution. This is a clear proof that although separated by the Taiwan Strait for over 60 years, the mainland and Taiwan are still one family with a shared, inseparable history. We are also encouraged to see that, in recent years, the cross-strait relations have shown a good momentum of peaceful development and the exchanges and cooperation have continued to deepen. The direct and two-way postal, transport and commercial links have been fully established. And the two sides have signed the Cross-strait Economic Cooperation Framework Agreement (ECFA), a landmark document that will set up a win-win economic partnership. In the future, we shall make the cross-strait economic, trade and financial exchanges even closer, deepen industrial cooperation and strengthen wide-ranging people-to-people exchanges. We are confident the cross-strait relations will be further improved and developed. Second, the development of the China-UK relations. Politically, China and the UK maintain close high-level exchanges. This year, Premier Wen Jiabao and Vice Premier Li Keqiang visited the UK respectively. The financial and economic dialogue and the strategic dialogue between the two countries are functioning well. The two countries have decided to establish a high-level people-to-people and cultural exchange mechanism. Economically, the China-UK trade last year topped 50 billion US dollars, reaching another historic high. Now, we are working collaboratively toward the goal of 100 billion dollars in trade by 2015. In terms of the two-way investment, the number of China's investment projects in the UK is the sixth highest among all the foreign investors. Many Chinese enterprises have leveraged their presence in the UK to explore the European market. Although German investment in China has surpassed that of the UK, the UK is still the second largest EU investor in China. In recent years, the people-to-people and cultural exchanges between China and the UK have been quite “hot”. As we speak, the "Chinese language craze" in the UK continues to gain momentum, and Confucius Institutes and Confucius Classrooms can be found in many places in this country. There are around 120,000 Chinese students in the UK. In international affairs, both China and the UK are committed to free trade and oppose protectionism. We both advocate the reform of the international economic and financial governance mechanism, and have maintained close communications on regional hot-spot issues. On the whole, China-UK relations are in a good shape. Not long ago, Premier Wen Jiabao’s official visit to the UK achieved a great success, and realized the purpose of enhancing mutual understanding and promoting cooperation. This visit has made a big impact in the UK and received rolling TV coverage. Leading British newspapers published quite a number of commentaries on what this important visit means to Britain. When visiting Shakespeare's birthplace, Premier Wen emphasized the importance of cultural exchanges and mutual understanding. At the MG motor plant, Premier Wen offered his support for China-UK bilateral economic and trade cooperation. At the news conference, Premier Wen called for mutual respect and equal dialogue on human rights between China and the UK..., leaving a deep impression upon the British public and receiving quite positive reactions. Even days after the visit, some newspapers still ran essays to discuss China-UK relations. I trust this is a good thing. All of us, both in China and the UK, need to think about how to take bilateral relations forward. What we need is more discussion and consensus. Such efforts will generate stronger momentum for our partnership. The relations between China and Scotland are very strong. Scotland has released its "China strategy" twice, and attaches great importance to cooperation with China. First Minister Salmond has visited China twice, and he is planning his third trip in the months to come. Scotland is a world leader in new energy and life sciences. And its financial services are also advanced. All these provide immense potential for China-Scotland cooperation. We have carried out very good cultural and educational exchanges. For instance, two Confucius Institutes have been set up in Scotland, and many universities are vying with each other to establish Confucius Institutes. The National Ballet of China and the Shanghai Peking Opera Theatre will take part in this year's Edinburgh International Festival. Two cute giant pandas will be settling into the Edinburgh Zoo at the end of this year, and this is indeed a big event and a happy event in our bilateral relations. Thirdly, I would like to greet and thank the Chinese compatriots in Scotland. The Chinese Consulate General in Edinburgh covers a region that is the host to over 80,000 overseas Chinese and 38 Chinese associations. Among you are not only senior compatriots from Hong Kong and Guangdong, but also new immigrants from the mainland. All of you come together to form a new Chinese community. You have a proud tradition of supporting and helping each other, serving local communities, loving the motherland and your homeland, and being actively involved in local politics. Equally, you have given strong support and made important contributions to China’s economic development. Moving me most is your strong emotional attachment to the homeland and your hometowns. There are no better examples than your support to build the Qingzhou Township Primary School, which is in a poverty-stricken area in Guangdong, and your generous financial aid to Wenchuan and Yushu and other disaster-stricken areas. At the same time, you have always supported the peaceful reunification of the motherland, and worked with us to promote cross-strait relations. In addition, our overseas compatriots very much value the Chinese culture and language heritage. You have overcome difficulties and continued to run Chinese language schools to promote Chinese language education. You have also educated your children to the importance of preserving the Chinese cultural identity and at the same time carrying forward the friendship between China and the UK. I would also like to take this opportunity to thank our compatriots for your support and help to the Chinese Embassy and Consulate General in Edinburgh over the years. I look forward to your continued strong support to Consul General Li Ruiyou. The Chinese Embassy and Consulate General in Edinburgh will continue to keep our compatriots’ well-being at heart. We will conscientiously conduct diplomacy for the people and, we will do all we can to protect your legal rights and interests and help address our concerns. We will further support the Chinese language education and provide assistance in funds and teacher resources. And we will also vigorously support your efforts to promote solidarity, build a positive image for Chinese communities, play a greater role in politics and strengthen China-UK relations. Finally, I wish our compatriots prosperity, good health and family happiness! 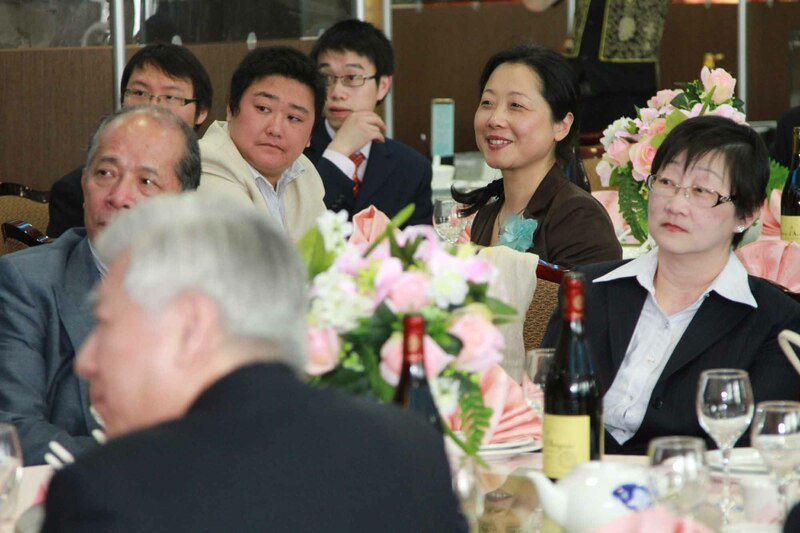 On July 11, the overseas Chinese and student communities held a welcome luncheon at the See Woo Seafood Restaurant in honour of Ambassador Liu Xiaoming and Mrs. Liu who were paying an official visit to Scotland. 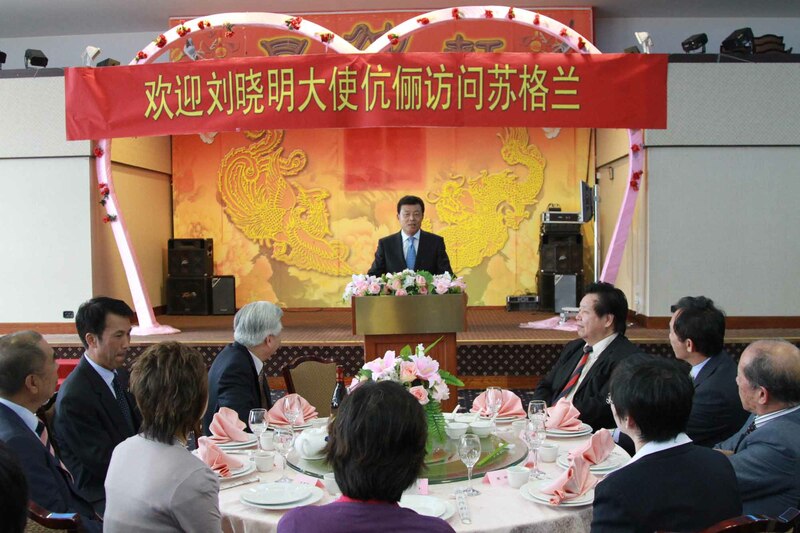 The luncheon was held by the Joint Chinese Association of Scotland. Also present were representatives from the Chinese communities in Glasgow, Edinburgh, Dundee, Ayrshire and other places, Northern Federation of Students, Federation of Students in Glasgow and Chinese companies as well as Mr. Li Ruiyou, Chinese Consul General in Edinburgh. The above speech was delivered by Ambassador Liu at the luncheon. 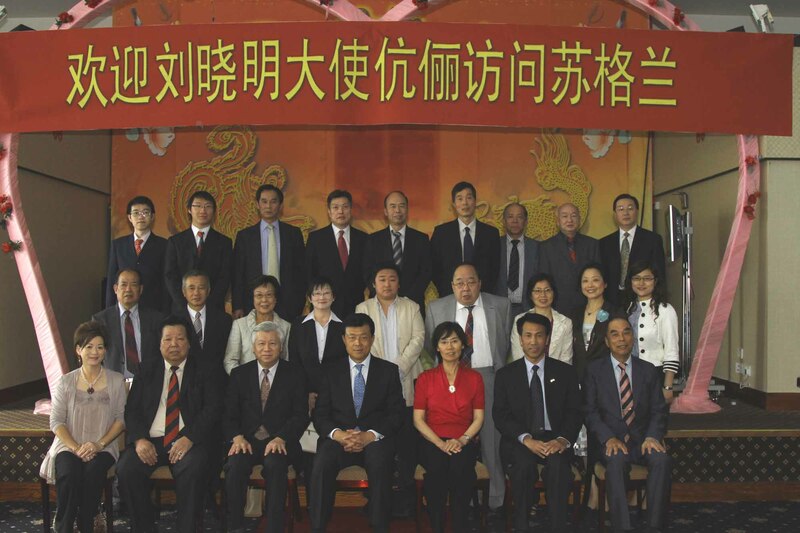 Leaders of the Chinese communities expressed their huge pleasure to meet Ambassador Liu for the first time. Since he took office, Ambassador Liu has actively promoted the development of China-UK relations and China-Scotland relations. Such efforts have been quite productive. Particularly, Vice Premier Li Keqiang visited Scotland this year, which contributed to further progress in China-Scotland relations. And the Chinese communities are quite happy that two giant pandas will be settling in Edinburgh. The overseas compatriots wished Ambassador Liu and Mrs. Liu a successful visit to Scotland and looked forward to further growth in China-Scotland relations. The overseas compatriots are ready to make even greater contributions to the development of the motherland and the friendly cooperation between China and Scotland. Ambassador Liu and Mrs. Liu in a photo with the representatives of the Chinese communities and students in Scotland.